Day and night blinds are available in an exclusive range of colours. Control the light whilst maintaining the view, or close completely for privacy. Day and Night Blinds - Privacy When You Want It! Day and night blinds, also known as Zebra and Vision blinds, are our best seller and very much on trend for 2018. These types of blinds can be installed non-invasively, and can be mounted to a wall, recess, or even a ceiling. They are very versatile, as they allow you to enjoy sunlight at any time of day because of their convenient 2-in- 1 blackout or light-filtering options, which allow for universal control in how much light is allowed in, or not allowed in. Many people favour this type of blind because it fits virtually any window. Free-hanging systems involve only the top portion of the blind to be screwed in or fixed in place, and the rest of the blind and lower body is free from any restraint. Motorised day and night blinds can be operated with either a remote control or switch installed on the wall. Motorisation allows the blinds to be programmed to open and closed at different times of the day and can synchronise the opening and closing of several different blinds at once. Your home should be a place where your children are safe and protected, but there are hidden dangers in many homes where the cords and chains of window blinds and curtains can pose a serious risk. Young children, particularly under the age of three, can strangle in the loop of cords and chains from window blinds and curtains. A number of deaths of children from strangulation caused by loose cords and chains from window blinds, have been reported by the media in recent years. Move beds, cots and furniture away from windows. Keep cords and chains out of reach of children – cords should end at least 1.6 metres above the ground. Make your existing blinds or curtains safe – try to get rid of cords ending in a loop – learn how easy it is by watching the video above. Buy the safety items featured in our video in order to secure blind cords. Choose new blinds or curtains carefully – there are now many options available that don’t have cords or chains. Check that the blind includes a safety device for keeping the cord out of the reach of children and that the safety device meets the safety standards EN 16433:2014 and EN 16434:2014. Check that written instructions for assembly, installation, use and maintenance are provided, and follow them if you are installing the blind yourself. Further information of the new safety standards is available from the NSAI. 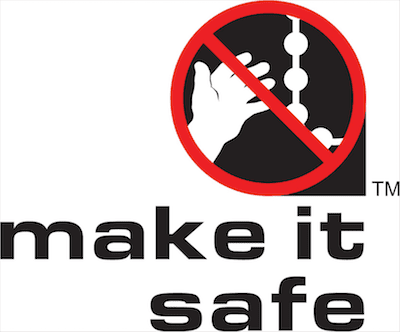 Keep window blind cords and chains out of the reach of children and follow the safety instructions. Using safety devices may reduce the risk of a child being strangled but nothing can be considered risk-proof. Why Choose Manor Interiors To Supply Your Window Dressings? We love Day and Night blinds. They are our best seller and for good reason! 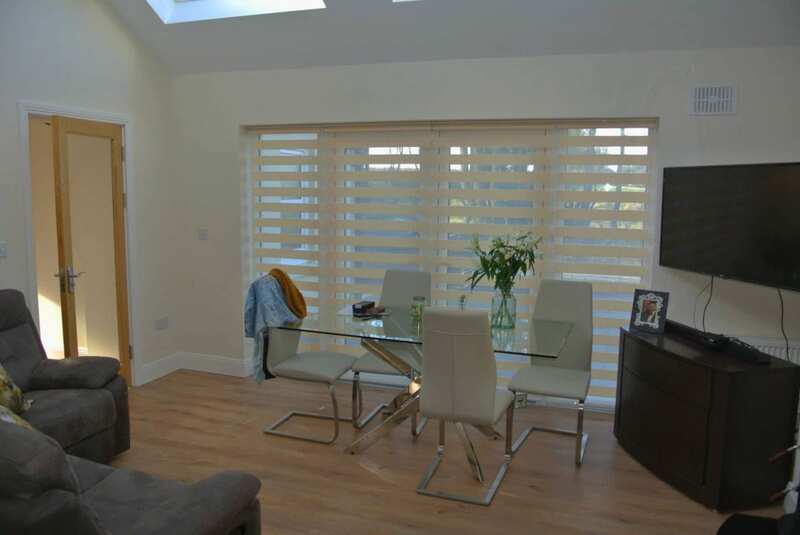 Zebra blinds are this year’s trendiest blind, they look great and functionally have many benefits! Day and night blinds regulate the amount of light entering a room. Instead of settling for curtain, you can choose day and night blinds that will give you the benefit of both a blind and curtains. They comprise a double fabric layer with sheers strips, which you can line up to suit your taste. These blinds will provide you with privacy even during the day and still let light into your house. You can raise or lower the horizontal layer of translucent strips depending on the amount of light you want in your home. These blinds are the ultimate modern window solution for any home. They have two alternating fabric layers that dim out or filter light producing an effect similar to a zebra pattern. These blinds provide privacy, beautiful view, light control and contemporary style. They are suitable for every room in your home bedroom, living room or study. Cleaning and maintaining zebra blinds is easy and you can simply operate them using a coordinated colour cord attached to them. Control light. A household with children can greatly benefit from day and night blinds since you can turn them to let no light in the room during the day when your children are sleeping. This enables them to get enough sleep without waking up due to bright light. You can also take a nap during the day comfortably. Provide privacy. Apart from preventing light from getting into the room, day and night blinds enable you to carry on with activities in your home without anyone else seeing you. Privacy in rooms like your bedroom and the bathroom is very important – vision blinds are a great choice in this instance. Temperature Control. During winter, these blinds can prevent draughts. They won’t reduce your heating bill, but are helpful none the less. During summer, they prevent too much sunlight from entering your home and can help with over heating in sunrooms. Keep your home stylish. Day and night blinds do not come in one colour or style. They are available in many styles and colours. When it comes to choosing the best option, you can pop into our showroom to see our full range range available. For more information about our range of free hanging day & night blinds, click the button below . . .
For more information about our range of motorised day & night blinds, click the button below . . .
Click Here To Get Your Free Quote Today! Follow these tips, to keep your Zebra Blinds in Tip top Shape. Clean any small spots with a damp cloth. Use the fabric cleaner attached on your Vaccum to get rid of any dust or cobwebs. We don't recommend removing and washing them as this can cause damage to the material when not done professionally.